I'd like to know very much what you think about this website. Please take the time to leave your comments in this public guest book so we can share your thoughts with other visitors. Any suggestions on improvements or make it more friendly-user, please let me know. In the past, you were able to submit your submissions directly to the website but someone ended up adding many advertisement junk. The only way you will be able to submit your inputs will be via email, and I will load your comments. Please put your name, masonic affiliation and comment in the body of your email. You have designed and maintained an excellent website. It has proven to be a great resource for things Masonic. Congratulations! Great site, extremely informative and – contrary to many of your feedback messages – the Spinning Clock is absolutely, sublimely Splendid…! I was very impressed with the content of your website. I forwarded this to many members of my Lodge. I would like to plan a Lodge bus trip to the battlefield and perhaps attend Lodge there or nearby. If you have any suggestions they would be fully appreciated. I am a Past Master of my lodge in Johannesburg, South Africa and we are always looking for material to keep the brethren interested and enthusiastic. I just wanted to say another thanks and well done for all the work in keeping the site going. Much of the content has been of value and interest to me in my recent masonic studies. Great website hope you keep your website this is a good inspiration since I have always wanted to be a freemason and spread the brotherly hood. My apologies if your title has changed since. I am the Assistant Secretary for the Lodge of Fidelity #231 G.R.C. here in Ottawa, Ontario, Canada. I am highly impressed with your website and the amount of work you've put into it. I found the section containing past masonic articles of extreme interest and wonder if you could grant permission to me to reprint those I would find applicable to distribute to our lodge members (only those that contain basic information or history as I do not want to reveal anything relating to the 2nd or 3rd degrees to our 1st degree members)? Of course, due credit to you, the website and the original author(s) of said articles would be immediately given upfront. I am curently Master of Gilwell's unofficial Lodge Venturer no 7897 and I read your pages with interest I also attend the "Gang Show Lodge" Red Scarf no 8448. Fraternal Greetings from one of UGLE Kindred Lodges I hope all continues well. I received this in this morning’s mail from a brother and dear friend in Dearborn, Michigan (near where I live). First, I’ll accent the positive. The site and all the work that you put into it is just awesome. Many thanks for sharing the knowledge you’ve gained with the craft. You have labored long and hard in the quarries of knowledge. Well done. Now, my complaint. The spinning clock is quite annoying. Every time I move my mouse to click on something it is dragged to that point and remains there. Is there any way to delete or get rid of the clock? My name is Anthony Delucca,WM of Dante lodge #174 located in New Orleans LA. Good site lots of info. I was thinking of adding a Masonic symbol to my business cards. I appreciated finding clear guidance on that subject. I've been to the site before and it continues to provide knowledge for me. So, again Thank you for that. I hope all is well and that the interval since the last website update is due to lack of new info rather than some personal distress. I apologize that I haven't visited the site for as while but I was looking through my old favorites to get ready for my new job as district deputy and remembered this as a good source for Masonic info. Hello Bro Joe, I have just spent the last hour looking at your website, it is great and most interesting, thank you for such a good detailed site. I am bro david Thomson pm of lodge st john 540 in Scotland. I have a Masonic team of brn who are all ex black watch soldiers and we go around various lodges working degrees. We did a fellow craft in my mother lodge in april this year and on Monday 11 oct 2010 we worked a master masons degree. Hello Joe, I am researching an old inn at Tamworth, NSW Australia called The Square Man Inn. Popular belief says it was built by a Freemason, thus the name. I hope you don’t mind that I have used some of your information about the square and its significance for the story to be printed in the Tamworth City News. I will cite your website in my story. Thank you for your fascinating information. I’m sure it will evoke a response from Tamworth residents who have been intrigued about the inn for many years. My brother. Thanks for such an informative and well designed Masonic website. It is one of my working tools daily. The Freedom that man enjoys is what makes this both possible and enjoyable. Masonry has two sub cornerstones in my opinion, freedom and loyalty. And as a Master Mason I am thereby enabled to be both speculative and operative and only through these can we collectively continue to benefit mankind and ourselves. Do not mistake the blending of Freedom and Loyalty. They are separate but symbiotic and coexist with EQUAL importance. They can't survive without each other, nor can Masonry. Being a man, freeborn is in our doctrine. It's relevance is evident in our continued growth and success as the greatest fraternal earthly order for the benefit of mankind the world has ever known. I only hope all brothers will find and enjoy these phenomenal workings. Brother love the information on the site. The spinning clock that follows me, feels like I am being tracked by a swarm of bee’s. I normally don’t have ADD but I think I do now. Other than that I think your sight is great and hope I can return some day. I am so thankful my research turned up your website and I feel that I have found in you another Brother Mason who really cares about the future of our great fraternity. I look forward to viewing the site regularly. I would welcome introductory information about the site. Such as, how long has it been up; what inspired you to get it started; and what could brothers like me do to assist you, etc. ; in addition to contributions of course? May God bless you, your family, and your wonderful efforts in spreading Freemasonry to fellow Brethren around the world. And thanks again for your willingness to aid and assist a very appreciative Brother. I have found the discussion about the marriage bond really interesting and quite astounding! I love it and I pray that my brothers enjoy it as well. It’s so real. Thank you for posting that. My name is Sid Chedrawe. I am a menber of John Albro Lodge #122 on the Registry of the Grand Lodge of Nova Scotia (in Canada). I love your website. You site has been a great conduit of information for me and another Brother of mine. Keep up the good work. But I do have an issue that I can’t remedy. I read on your site of a story about recognition. It went into one Brother stumbling upon another because he wore a lapel pin or ring. It also delved into how we should not go without our different modes of recognition displayed because we could go without knowing who is and isn’t a Brother and mission out on friendship…. I have searched and searched and can’t fins the article….the only thing I remember about its location is “page 4”… There is probably no chance that you know of its whereabouts….but if you do…could you remind me? I emailed you late last year to let you know how much I appreciated your website, and how instrumental it was in helping me to make my decision to petition a local lodge. I just wanted to give you an update. I am now a MM, having been raised on May 7th. I attended my first stated meeting last night and really enjoyed being able to participate in several votes we had (how to spend monies, assigning investigation committees for 3 petitioners, and then voting via ballot box for another petitioner to receive the degrees). I will be frequenting your site and studying our noble Craft for quite some time to come. Many thanks for the services you provide for the curious, for prospective candidates, and for Brothers. Hello. I hope this email finds you well. I am writing to thank you for your website. I am a Master Mason, a 32 degree Scottish Rite Mason, and a member of all three York Rite Bodies in New Jersey. Several of my brothers and I love to read and discuss Masonic philosophy. I have found your website to be a valuable resource. Thank you from all of us who seek more light! We owe you a debt of thanks and will help your efforts financially. Keep up the great work. Thank you for putting together a great website. I have always been a strong proponent of instructing our Brothers on the many aspects of our Order. I am in the process of forming a Masonic Education Committee for my Lodge (After reading your site, I'm going to change the name. LOL) Your site has given me a lot of great ideas that I will use. Again, thanks for spreading the "LIGHT" Brother. I was raised last Thursday and found your website yesterday, very easy to read and I have recommended it to brethren in Tasmania already, I particularly love the civil war stories. I've just spent a little time browsing your Masonic Trowel site and want you to know that I found some good links, especially those related to leadership development. Nice work. This topic has become of considerable interest in recent weeks, perhaps triggered by reading a book by Lee Iacocca; Where Have All the Leaders Gone? Then I came across a Masonic publication; It's About Time! Talk about a double whammy!! What a GREAT site! I've spent countless hours, much to my wife's dismay, reading and studying the writings within. With your permission, I'm going to start utilizing the articles for interpersonal teachings at our lodge. Keep up the good work! I just wanted to thank you for providing the Masonic Trowel website. I am not yet a Freemason, but reading several articles from your site helped me to make my decision to petition a local lodge. Your site incited a great desire within me to be a part of this historic and highly reputable Brotherhood. I look reading more articles in time, as well as some of the book selections from your suggested reading section, especially as I work to advance through the Degrees. Thank you again. I have explored your website and have found the information contained in it a valuable resource. I wish you all the best in this endeavor. There is one item I would change. The Java calendar/clock mouse trailer is a bit distracting. Other than that I really like you site. I will be recommending you site to my brothers and with your permission will create a link from my web site. Thanks for taking the time to build such a great site. It is amazing the amount of information you've compiled. I will be passing this along to my fellows at the lodge. What a great site! Thank you. Of course you know, all Masons being expert in our Craft, you're going to get some suggestions for correction. The "Clandestine" article is unattributed so we don't know whose misconception to address, but the article mentions George Washington's age as making his initiation somehow suspect. It was not. Washington was a "lewis", that is, the son or grandson of a Mason. Washington's grandfather was a Mason and therefor Washington was of lawful age at 18, although not initiated until age 19. The status of "lewis" s not completely extinct, although it has been some years since I researched it; further, in Washington, D.C., I understand that a Demolay boy can petition and be initiated at 18. Anyway, you've put together a marvelous resource, and I thank you for it. I actually came upon it researching the "Perfect Points of Entrance", and it has been quite interesting to discover how differently the terms are applied in the US as opposed to their older usages in Scotland, England, and Ireland. My congratulations on this wonderfully informative Website. I am sure that brethren who visit this page will be most pleased with the information. As a student and avid lover of history, it bought me great joy in reading about our brotherly accomplishments in the shaping of American History. Thank you. I just wanted to bring this small error to your attention. You have Bro. William Whipple and Bro. Charles Wilson Peale next to the same picture. I found very interesting information about masonry in you website. Thank you for sharing with us. I would like to mention just one wrong information : in France the name "The National Independent and Regular Grand Lodge of France and the French Colonies" doesn't exist since 1946; since this date it is named "Grande Loge Nationale Française" (GLNF) which is the only regular Grand Loge in France. Claude Roulet - F. M.
From the Beehive in Korea I wanted to send my gratitude and appreciation for the Masonic Trowel. By the exuberance of info on your website it keeps my travels for knowledge in the right direction. 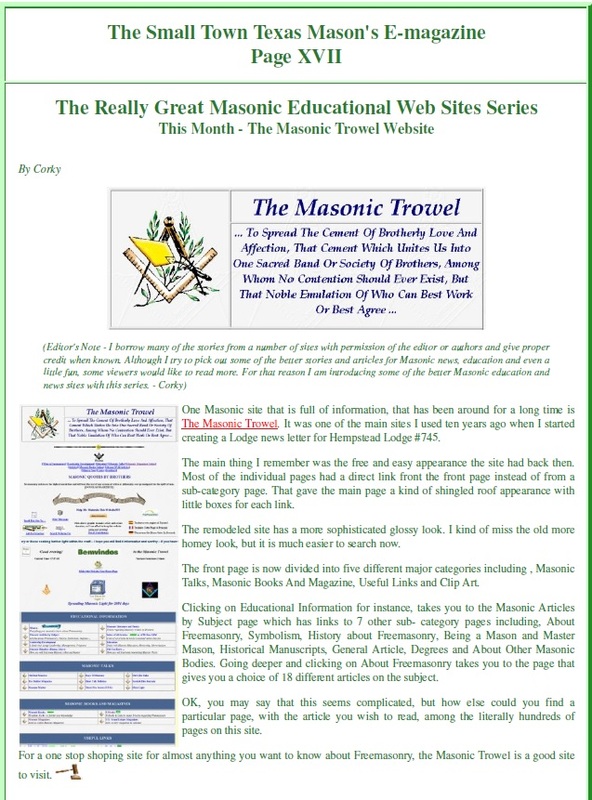 I particularly liked the Utube short introduction to Masonry which was very well produced, in fact every aspect of the web site gave an excellent review on Freemasonry in USA, and how Masonry started in the UK., each section was well constructed with excellent graphics. I found your website, and I am very thankful for it. Your site has help deepen my affection for Freemasonry. I had been wrestling with returning to a Lodge. And after reading several items on your site, and after several conversations, I have requested to become a member of King Solomon's Lodge. On searching for recipes for dinner I happened upon your site and found many answers to alot of my own questions. I am a relative newcomer , my gratitude for a site full of information and guides. A brother once asked me why I do what I do, a comparison, I have no direct definable reason other than to know that I have to be here in order to find out why. While odd I find it has a certain quality of beauty and trust in oneself to know how to make oneself a better man and at the same time /elping others in the same way. I would like to thank you for taking the time to build such an informative website. I found this site as an entered apprentice, it was a enormous help with all my questions. I will be a constant visitor to your site in the future. A great site for Freemasons. I take great delight in reading the various snippets on your site. Wor. Bro. Brian Mc Dowell. My name is Graham Bundle and I am currently the Master of The Woburn Lodge No.25 New Zealand constitution. Whilst surfing for some information regarding a presentation in our lodge, I came across your page, and found it a great source of current information. I am impressed with the depth and breadth of the content. My heartfelt thanks for a "job well done". I have a few years in Masonry (from the NY jurisdiction) and have written several speeches. If you would be interested in any of them to add to your site, I would be honored to send them on. I found your site very interesting, informative, and useful. You may find our site equally useful, I hope so. www.grandlodgeofallengland.org. If you would like to publish our link in your Grand Lodges section then please feel free to do so, and if you ever wish to visit us in York, then please accept this as an open invitation. Your site was referred by a friend and PGM as a source of Masonic lectures and history. Between your site and the MSA, I have not only been able to bring more light to my brothers, but have learned much myself and improved myself in Masonry. Greeting from Australia. This site is a wonderful resource for those committed to making a daily advancement in Masonic knowledge. The huge range of information and great presentation is obviously the product of brotherly love, strength of will and enormous labour. Congratulations and many thanks. Br. Carlos L. Jackson (PHA) St.Paul, Mn.